This page contains language that may be offensive or inappropriate for some viewers. Cpl. Brett G. Coughlin arrived with Delta Company in Saudi Arabia at the port of Al Jubail on September 13, 1990. For the next three months the company trained in the northern desert of Saudi Arabia. By Christmas, its headquarters were near the Al-Wafra oil fields of southern Kuwait. 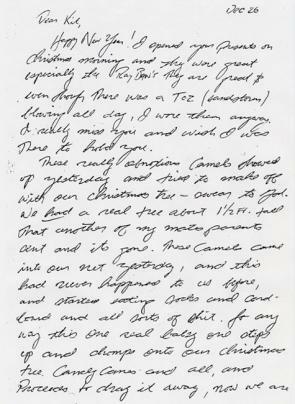 Coughlin wrote this Christmas letter to his girlfriend, Catherine, whom he later married. Happy New Year! I opened your presents on Christmas morning and they were great especially the Ray Ban’s They are great & even though there was a Toz (sandstorm) blowing all day, I wore them anyway. I really miss you and wish I was there to hold you.